Nitrogen Sports has been one of the most renowned Bitcoin sports-betting sites for quite a while now, and it expanded its offerings with the launch of an online poker site in late 2014. It's beloved by players who like easy BTC funding, anonymous and speedy withdrawals, and the ability to play cards without installing a bulky poker client application. That's right; this poker room operates through your web browser rather than a dedicated download program. The benefit for most people is that they can play on whatever platform they wish as long as it has a modern web browser: Windows PC, Mac, cellphone, tablet, and more! All gameplay is denominated in mBTC chips (1 chip = 1/1000 of a bitcoin) at this Bitcoin poker room and sportsbook. There are NO COUNTRY OR STATE RESTRICTIONS at Nitrogen Poker. All players, located anywhere on the face of the earth, are welcome here. The amount of player traffic is currently fairly small, but it has already eclipsed several of its competitors in the Bitcoin poker space, and we expect it to grow significantly going forward. There's no Nitrogen Poker rakeback program at all, so we're afraid that this poker site isn't the place to go if regular RB payments are what you're after. You might wish to consult our list of rakeback poker rooms instead. 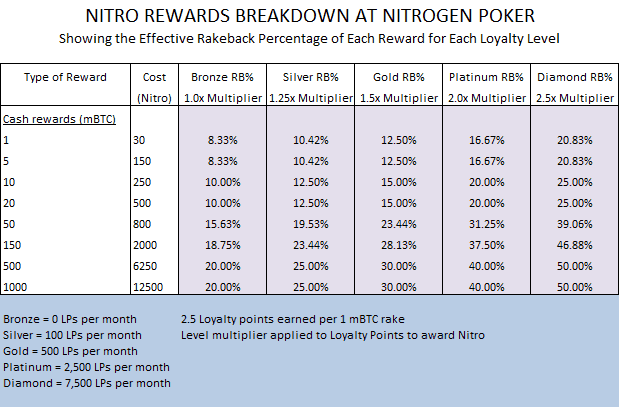 What Nitrogen does provide to its players is a valuable loyalty program. As you play at the tables, you'll earn a set number of Loyalty Points based on your rake total and a variable amount of Nitro depending on your position in the program. This Nitro can be exchanged for bitcoins and free bets in the sportsbook, so it functions basically as a type of rakeback. You'll get between 10% and 100% cashback value depending on how much you can grind in a month. 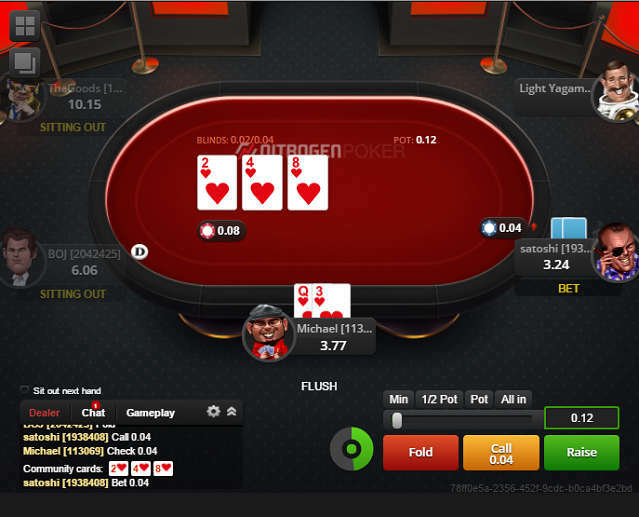 Although you're reading this review because you're primarily interested in poker, there's a compelling argument for making Nitrogen your go-to destination for all your sports betting endeavors as well. It charges low juice on almost all markets – of which there's an extensive selection. Not only can you bet on prominent contests in MLB, NBA, NCAA, NFL, EPL, and other well-known leagues, but you can also put action on quite obscure events as well. Nitrogen does feature a casino section too, but there are only seven games. STEP 1: Clear your cookies - this is mandatory for the proper tracking of your account. Click the appropriate browser button below for instructions. Step 2: Click the banner below to create your Professional Rakeback Nitrogen Sports account. Step 3: Click "I Agree, Create my anonymous account.". Step 4: Your account will be instantly created without the need for entering your name, address, or any other personally identifying information. Step 5: For security purposes and also for ease of logging into your account in future, create a username and password on the page that appears. Step 6: (optional) To verify that your account was properly tracked, just contact us by Skype or email and inform us of your account ID (the numbers following your nickname at the right and top of your screen). Step 7: (optional) You will appear at the tables as "satoshi" by default, and this is the name other users will see. You can change your screenname by going to the account menu in the top-right of your browser and choosing "Settings." Step 8: Within the account menu at the top-right, go to "Cashier." Then press "New Address" to create a valid Bitcoin deposit address. Step 9: Send any amount of bitcoins to that address from your Bitcoin wallet. Once you get a single network confirmation on your deposit, you'll have a funded and ready-to-go Nitrogen Sports Poker account! The games at Nitrogen are divided into Cash, Sit & Go's, and Tournaments just like at almost every other poker room on the internet. Before taking a seat in any of these games, we strongly advise you to click the settings icon in the top-left of the lobby and adjust a couple of parameters first. Go to the "Tables & Themes" tab, and turn on "Open tables in a new window" and "Four color deck." This will prevent you from struggling to click back and forth in multiple tabs of your browser and will safeguard you against misreading your hand. The other settings involve backgrounds, sounds, avatars, and a few other elements that you can customize according to your tastes. One unusual feature at Nitrogen is the site-wide chatbox, which shows the last message by default at the top of the poker lobby. You can expand it by clicking on this message, and then the box will open up, allowing you to see several lines at a time and type in your own comments. This feature is more annoying than useful, but it does create a feeling of community as people cheer for their favorite sports teams, brag about their winning bets, and whine about rigged poker hands (some things are the same at every site). The most popular game is No Limit Texas Hold'em, and you'll typically see around a dozen tables with cards being dealt from 0.01/0.02 to about 0.25/0.50. There are higher blinds offered, and in fact, the lobby lists up to 200/400, but there are hardly ever any players actually sitting at these stratospheric levels. You can play 9-handed, 6-max, or heads-up. Limit Hold'em and PLO can also be found, but there are usually no more than one or two active games running. There's one other type of poker present in the ring games: Crazy Hold'em. Veterans of the old Paradise Poker may recall playing this format, under the name "Crazy Pineapple." It's similar to Texas Hold'em, but you get three hole cards instead of two. After the flop round of betting, every player must choose one of their three cards and discard it. Crazy Hold'em leads to intriguing strategic implications and looser gameplay than traditional Hold'em, but unfortunately, these tables are usually deserted. The biggest weekly events at Nitrogen Sports Poker are the 4.5 + 0.5 chip Saturday and Sunday tourneys that guarantee prize pools of at least 100 chips. Daily, you'll find a couple of 20 mBTC guaranteed tournaments that cost 1.08 + 0.12 to enter. 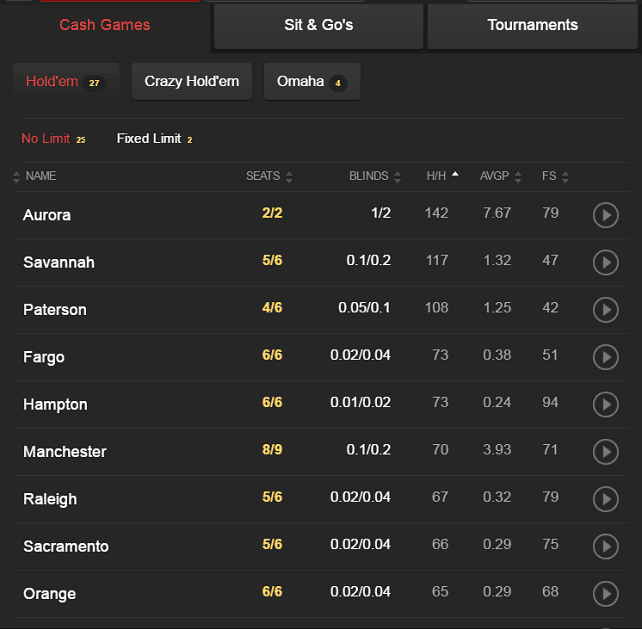 There are also a few smaller tournaments every day mostly priced between 0.1 and 0.6 chips. There's a freeroll each day that awards MTT step satellite tickets. Sit-and-gos are present as well, up to 0.025 BTC buyins, but they seldom fill. Nitrogen also runs freerolls every day and week for users who can achieve certain rake targets in cash games. 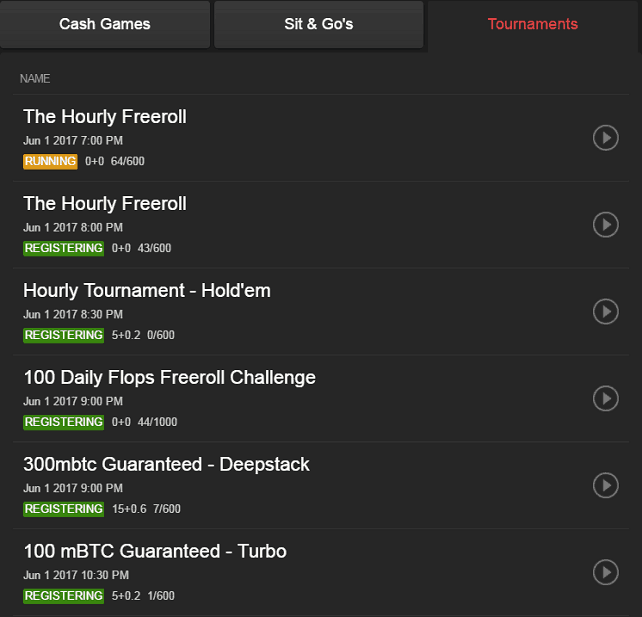 In total, there's more than 1.8 BTC up for grabs each week in these challenge freerolls. The poker software at Nitrogen is supplied by Cubeia, a Swedish developer that focuses solely on web-based gaming solutions and has been in the industry since 2007. While there's nothing amazing about this poker solution, particularly in comparison with download poker clients, it works smoothly and is easy to use. Undoubtedly, the decision to deliver up basic gameplay without a whole lot of frills was influenced by the need to remain compatible across a broad spectrum of devices. You have a betslider, buttons for fractions of the pot, and a box to type in the exact size of your bets, which is good because the buttons allow you to make quick bets while still preserving the ability to tailor your betsizing more precisely when needed. One odd thing about the poker table interface is the fact that dealer messages (like the community cards dealt and the betting action) are presented at the bottom of the table in a separate tab from player chat. It's easy to switch between them, and there's nothing really wrong with doing it this way, but it does take some getting used to. Because this is a Bitcoin-only site, all transactions are done exclusively in this cryptocurrency. Every customer has a Bitcoin address to which he or she can send funds, but it's possible to generate new addresses whenever you wish. 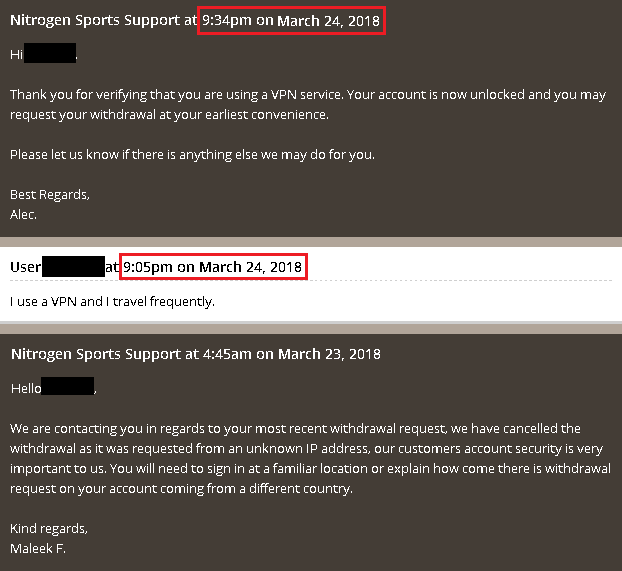 When you send BTC to your Nitrogen account, the sum will show up in your balance within a few minutes, but you can't actually use it at the poker tables or in the sportsbook until there's at least one confirmation. When requesting a cashout, the procedure is simple. Just enter the amount you wish to receive, the address of your Bitcoin wallet, and your password. Be aware that any amounts smaller than 0.00001 BTC will be rounded off, so you may have to leave a bit of spare change remaining in your balance. We initiated a test withdrawal from Nitrogen and are pleased to report that it took less than 2 hours from making the request until the coins were safely in our wallet. As long as you've ever deposited at least 0.005 BTC to your Nitrogen account, you can get a free withdrawal every six days. Additional cashouts beyond the first within a six-day period incur small charges intended to offset the cost of Bitcoin miners fees. Although Nitrogen doesn't compete heavily for new business with big bonuses or headline-grabbing freebies, it does take care of its customers with the Nitro Rewards system. The most sizeable freebet, for a whole 2 BTC, is priced at 12,000 Nitro. For Diamond players, this only takes 1.92 BTC worth of rake to achieve, so they're getting back more than they paid as long as they're willing to make a pick in the sportsbook! Of course, there's a lot of variance involved in making such large sports wagers, and there is a small vigorish that the book takes for itself. So this isn't quite the 104% cashback deal that it appears to be at first glance, but it's pretty damn close. Sports wagering is Nitrogen's main product, which it has been offering since 2012, a couple of years before it started dealing poker games. The broad selection of markets, reduced juice odds, and easy-to-use interface has kept bettors loyal to this book, which is regarded as the premier Bitcoin bookmaker online. When you log into your Nitrogen account, you'll see a list of sports along the left of the screen. 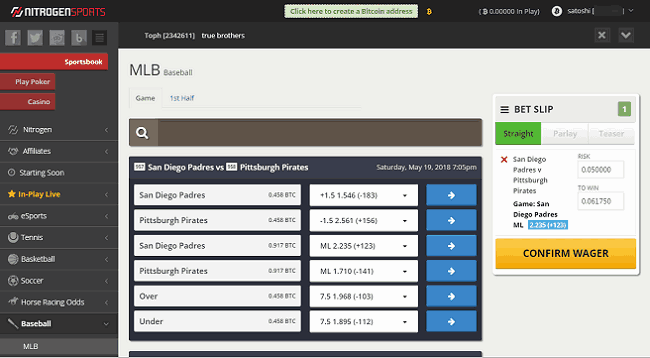 Clicking on any of them opens up a submenu containing the various leagues and special betting possibilities available. Most major athletic leagues are present, like Major League Baseball and English Premier League soccer. You might be surprised by the extensive palette of more niche organizations listed as well, like Korea Professional Baseball and the Bolivia Primera Division. After you select the type of match/wager you wish to place, all the upcoming lines for that selection will appear in the middle of your screen. You'll see the odds of each side of every contest along with the betting limit. The maximum possible bet varies wildly, but for the most popular games, it tends to be between about half a bitcoin and 2 bitcoins. Clicking a blue arrow next to a betting option will add it to your betslip. Within the betslip, you can enter the amount you wish to put at risk, and the system will calculate and display the sum you stand to win. You can place straight wagers, parlays that depend on the results of multiple happenings, and teasers that allow you to shift the points spread in football and basketball contests to your advantage. When you're ready to book your wager, click on “Place Wager.” You will then be asked to “Confirm Wager,” after which your bet will be accepted by the system and will be considered officially placed. Nitrogen's In-Play Live section permits you to place additional wagers even after sports competitions have already begun. This is a feature that has become more prevalent online as time passes, and it's now fairly standard at every modern sports-betting site. Unfortunately, there are usually only a few games listed in the In-Play Live area of the sportsbook, so if you're a really big fan of live betting, Nitrogen might not be able to satisfy you in this department. There are tons of sportsbook promos at Nitrogen. The most famous is probably the monthly Parlay Jackpot competition. Three leaderboards (classified by amount staked) each reward the seven users with the highest parlay paydays during the month. Even if a parlay loses by a single leg, it still qualifies for the Parlay Jackpot. 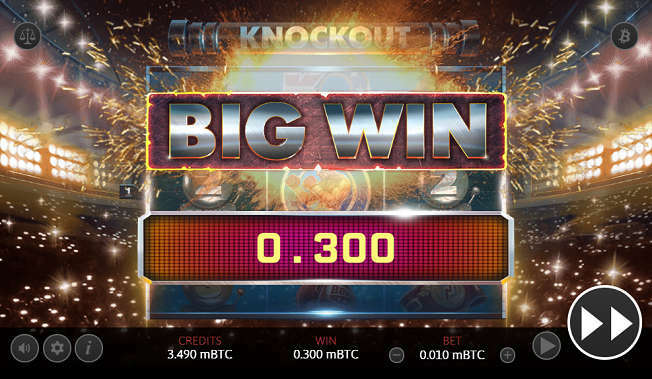 The top prize is often more than 1 bitcoin! Time-sensitive offers, geared around specific sporting events, abound. Examples include complimentary credits for successful NCAA March Madness bracket predictions, free bets for placing parlays on certain games, and rewards for correctly guessing who will win the most medals in the Olympics. Almost all of these specials are not advertised on the Nitrogen main site, so you'll have to keep an eye on the Nitrogen Sports blog and Twitter to participate. This very limited game selection would be forgivable if the gameplay was stunning with top-notch graphics and a wealth of bonus features. Sadly, this is not the case. The Dice interface looks like some kind of wacky '60s B movie, the Blackjack tables use weird, six-sided cards, the flow of the Baccarat game is almost incomprehensible to the newcomer, and the single slot machine is an old-school, three-reel, single payline affair. If you're an online casino enthusiast, then Nitrogen's product will most likely not measure up to your standards. You might want to check out our list of the best internet casinos for USA players to get some more ideas on where to play. Support concerned about user safety and responded in under 30 minutes. Through a "Help" link at the bottom of the website, you can receive assistance with any problems you encounter at Nitrogen Poker. The in-house ticketing system is the fastest method you can use with replies typically arriving within a couple of hours and in many cases, mere minutes. You can also send an email to support[at]nitrogensports.eu if you prefer. There are sometimes support personnel watching the global chatbox too, and they may answer your questions in that forum as well.